Japan seems to be ‘the’ location for British designers working in the hotel interiors sector, and in this case it’s Conran & Partners working in Nasu. The hotel, The Niki Club, was originally constructed in two phases, in 1985 and in 1997, by Japanese architect Akira Watanabe, but in 1999, Conran & Partners was appointed to design phase three. This is called Niki Club East and comprises 24 new bedroom pavilions, a lobby, restaurant (pictured left), spa and meeting room. The hotel opened at the end of July. The whole hotel concept revolves around Japanese perceptions of landscape, interaction with nature and relaxation. Located in an idyllic forest setting beside a stream, the Niki Club is only two hours drive from Tokyo and a favourite among Japanese businessmen looking to unwind. The architecture and the design is thus conceived as a journey from the city into the forest and reflected by materials like concrete and wood. The main lodge, a two-storey building, houses the hotel lobby, restaurant and terrace. Glass walls spanning the floor and roof slabs offer panoramic views over the landscape. As Conran & Partners managing director Richard Doone says, ‘With this upper level raised above the forest floor, the connection is purposely remote and visual, rather than physical.’ In the lower level, there is a spa, treatment rooms and a guest meeting room with large glass screens leading on to a private deck and external hot tubs. Further down in the parkland, the 24 timber-clad bedroom pavilions are informally clustered in another clearing around a communal court (above). Each bedroom pavilion, either one storey or two storey, has an undulating roofline that recalls the nearby mountains and treetops. Inside there is separation between the living areas, complete with kitchenette, and the bedroom areas (above left). Sliding glass doors lead out to decked areas and hot tubs. 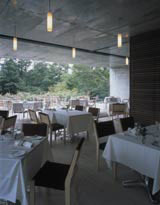 The meadow theme influences the pavilion’s interiors, which feature bespoke carpets and Arne Jacobsen Swan chairs. Interestingly, Conran & Partners was asked to respect Japanese custom, but never to imitate its style. The result is a piece of organic architecture that blends harmoniously with the indigenous way of living. Traditionally ANA Hotels International is a Japanese chain of luxury hotels around the world. For its venture in Tokyo, the group commissioned GA Design to design a smaller hotel similar to the European ’boutique hotel’ concept. The Strings Hotel opened at the end of May and features 200 bedrooms. In keeping with a Japanese feel, GA Design has used horizontal slatted screens to provide a sense of privacy in the corridors. On arrival at the 26th floor lobby, the atrium is hidden by simple doors, which then open into a 900m2 space where water, light and shadow create a mesmerising effect (pictured left). Gently-moving water skims most of the floor so that the restaurant and bar seem to be floating. The choice of materials ‘is deliberately rich and textural in order to allow a sense of nature to be present, even within a clean interior,’ says McGinnity. The rough stonework on the walls is emphasised by natural daylight, throwing shadows during the day and becoming a rich backdrop in the evening. The river-washed pebbles at the base of the reflecting ponds also pick up the daylight and are then transformed at night when the lighting changes. A bridge that arcs across the entire atrium space is a direct reference to traditional Japanese garden design but is finished in glass. Art has been especially commissioned for the bedrooms and the public areas, with a 10m-high photograph by American photographer Michael Holmes dominating the lift lobby. All the guestrooms feature ebonised wood and walnut, separate wet rooms and the latest technology (below left and right respectively). The furniture is a combination of bespoke and purchased. Following the recent spate of country retreats that are combining old school glamour with contemporary dÃ©cor and comforts, The Grove aims to attract a mixed set of stressed out urbanites, golf lovers and families. The former home of the Earls of Clarendon, the Grade II*-listed mansion is set in 300 acres of private parkland in Hertfordshire and is located 18 miles from central London. Opening in mid-September, The Grove has taken more than four years in the making, with Fox Linton Associates – of One Aldwych Hotel fame – being given the luxury of sourcing antiques, modern furniture and art from all over the world. Four IV was initially called in to design the identity of the hotel, but ended up creating all the luxury packaging for the hotel’s perfumery and stationery as well as signage for the public areas. The 227 guestrooms and suites (pictured top, with bathroom pictured below) feature views over the parkland, modern comforts like plasma screen TVs and DVDs, and antique and bespoke furniture pieces, such as a four-poster bed made of Perspex and glass. ‘In the bedrooms we wanted to drag out some of the British eccentricities,’ says Fox Linton Associates design director Martin Hulbert. Four restaurants, three bars and an 18-hole year-round golf course all add to the leisurely feel of the place. But it’s the Sequoia Spa (above), with its 12 treatment rooms, health bar, two pools and the Stables restaurant designed by Collett Zarzycki, which will no doubt prove a popular stop.